Sunday was one of those days, you know when you wake up and all you feel like eating is garbage? I always start my day regardless of how I end it, eating a bowl of oatmeal, loaded with fresh berries and cinnamon. Somehow I can’t seem to get revved up for my day without a bowl of oats. However, after that bowl on Sunday it was all downhill. Chocolate covered almonds and cherries were my mid-morning snack. Then I followed it up with Imo’s pizza that I had when I took my dogs over to my moms to swim and celebrate their dogs birthday. Thank goodness they didn’t have cake. 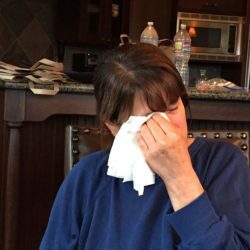 For dinner, I didn’t feel like cooking – gee I wonder why, I was so tired (junk food drags you down), so we ordered out barbecue. 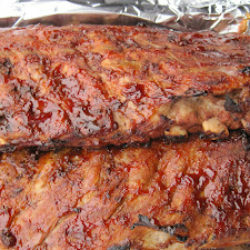 Of course I figured I might as well screw up the rest of my day and get ribs, and were they good! Thank goodness I didn’t like the baked beans or slaw that came with them. At bedtime I finished my day with 2 extra-strength TUMS – thank goodness for TUMS! Come Monday morning I felt disgusting inside and out. I knew I needed to eat breakfast or I’d stand the chance of having another binge, so I had my usual oats. By the time I was ready for lunch I wanted it to be super duper healthy, so I rummaged through my refrigerator and cupboard and decided to make a Healthy SuperFood Buddha Bowl – packed with vitamins, minerals, antioxidants, protein, and low in fat. It was so good! 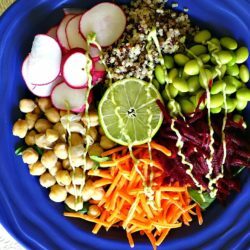 What are Buddha Bowls? 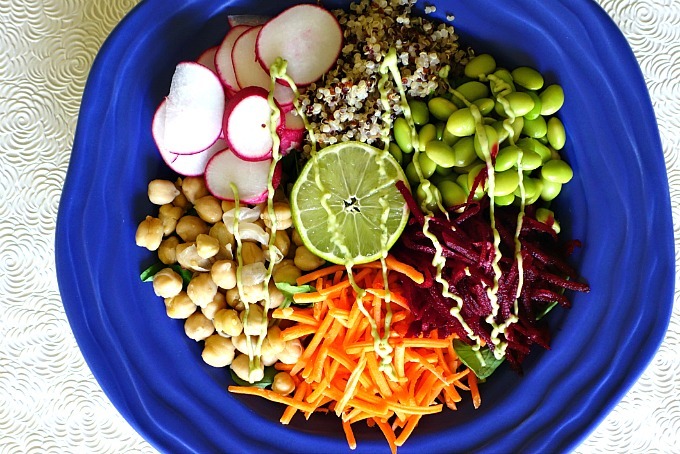 Buddha bowls are packed with nourishing comfort foods that will fill your belly and soul. They incorporate the eating principles of Chinese and Japanese medicine and consist of a melting pot of flavors and textures that include raw or roasted veggies, beans, a whole grain, like brown rice, farro or quinoa, and sometimes fish. 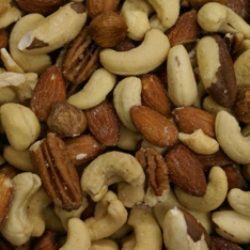 This way of eating is thought to be “ideal” for reducing toxins in the body (what I needed after my diet on Sunday), and lowering your risk of chronic diseases. Carrots – this root vegetable is high in beta carotene, vitamin A, which helps to maintain your eye health, and vitamins K and C. Carrots are also high in fiber, which keeps you feeling full longer and with 400 mg of Potassium in one carrot it also helps to ward of strokes, high blood pressure and anxiety while keeping you well hydrated! Raw shredded beets – helps lower your blood pressure, boost your stamina, fight inflammation, has anti-cancer properties, are rich in nutrients and fiber, and valued for their support in detoxification and helping to purify your blood and liver. Shelled Edamame – high in protein and fiber, low in fat, and because it has a high concentration of alpha-linolenic acid, an omega-3 fatty acid, it can lower blood cholesterol decreasing your risk of stroke and heart disease. In addition, edamame offers bone strength and consists of compounds believed to lower your risk of certain types of cancers. Raw Radishes – high in fiber, helps ward off cancer cells, and besides being packed with vitamins and minerals, a half cup of sliced radishes is just 9 calories making them a great snack if on a diet. Eat raw or cooked (I prefer mine raw). Garbanzo Beans – full of protein, fiber and are loaded with vitamins and minerals. As you can see this Buddha bowl won’t just provide you with a nutritious meal but will give you the energy you need to get through your day. 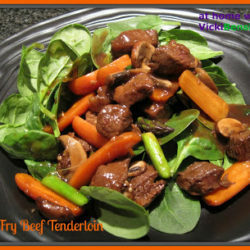 Meals like this are so quick and easy to prepare. In fact, I find that if you take one day a week to prep all these veggies or vegetables, grains, fruit, and nuts of your choice – plating them in a bowl when you’re ready to eat takes only minutes. If going to work layer in a Mason Jar or like my Salads in a Jar. For that extra added flavor I made an Avocado Dressing (will share later) that I drizzled lightly over my bowl. Use whatever you prefer from fresh squeezed limes, lemons, or your favorite salad dressing. 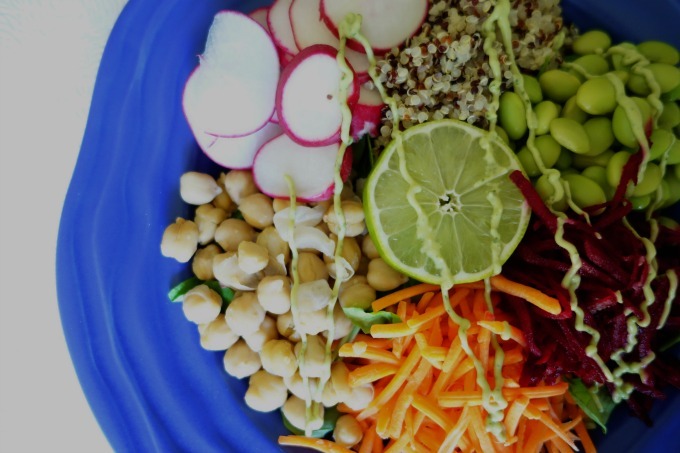 Have fun creating your own Buddha Bowl or try my recipe below…………………………………………..
A powerhouse meal that's not only quick to prepare but sustains you throughout the day! Using a large soup bowl or bowl add arugula and spinach mixing to combine. Top remaining ingredients in sections and in a concentric circle. Drizzle your favorite dressing or fresh lemon or lime juice over the top. I needed this Buddha bowl on Sunday—after throwing a party Saturday night and sampling two many sweets, I can relate to your day. I love quinoa and this is one fabulous way to eat it! I’m usually pretty good and the awful part is once you do that it’s hard to hold back. This buddha bowl put me back on track. I was feeling great after eating some. I think we all have days like that. Imo’s doesn’t tempt me, but BBQ? Yes please. So a day-after Buddha Bowl would be a good thing! This looks great — thanks. Pizza would be my last meal and Rocky Road ice cream. BBQ is high up there though. 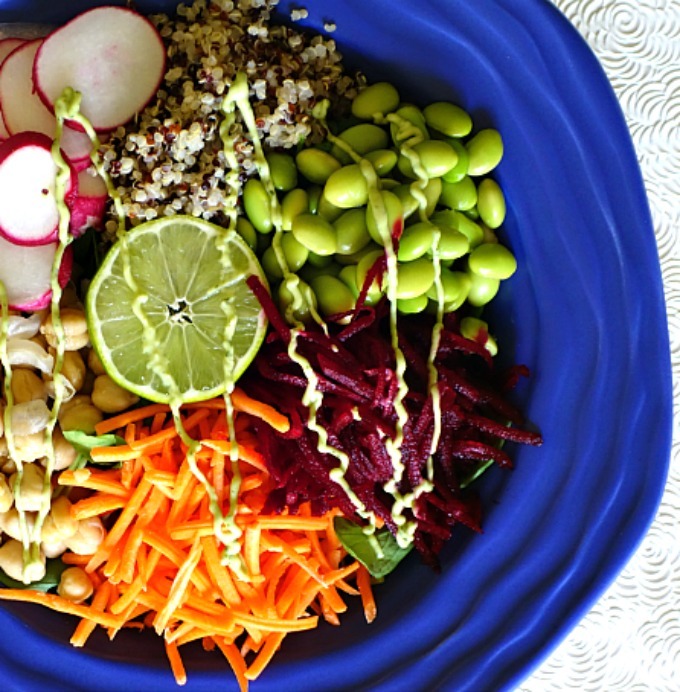 Buddha Bowls are good for your body inside and out. It did the trick! I want this buddha bowl for my lunch! It’s packed full of goodness and deliciousness, Vicki. You can have it, just toss it together, it’s quick.